HAVE YOU HEARD THE HIT SONG *WES WILL COOK JOE*? OR SEEN THE CLASSIC MOVIE *YOUR WRIST PUMP*? HOW ABOUT THE CHILDREN*S BOOK *FOOD FIGHT DUDE*? WHAT? YOU MEAN YOU DON*T KNOW THEM? THAT*S BECAUSE THEY*RE OUT OF ORDER! TAKE AWAY A LETTER HERE, ADD A LETTER THERE AND IN 5 STEPS THE CORRECT ANSWER IS REVEALED! CLUES ARE READ ONE AT A TIME. 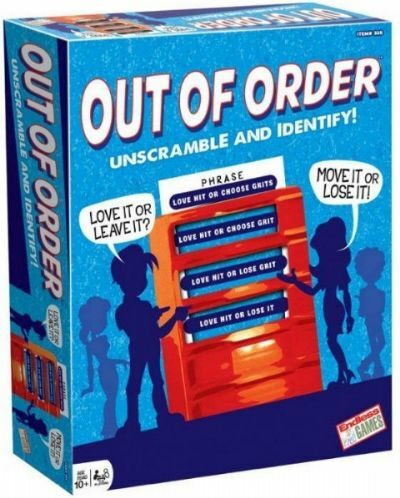 BE THE FIRST TO UNSCRAMBLE AND IDENTIFY THE OUT OF ORDER TITLE TO WIN!